It’s safe to say that a few of us at Orr’s have a green thumb. We may spend time on the farm tending to acres and acres of some of the area’s finest fruits, but we still love to care for our very own flower beds and cover crops. Get your area ready for soil. First things, first. Get the ground ready for your garden. Rid the area of rocks or debris by tilling the area between 8-12 inches beneath the surface. Use coffee grounds as fertilizer. This is a safe, eco-friendly way to add nitrogen to your garden. Nitrogen is a mineral that is proven to stimulate plant growth, making your garden greener than ever. Get your seedlings started with citrus. Did you know you can plant a seed in citrus peels to encourage healthy growth? Once your seed germinates, simply plant the seed and the citrus peel in your garden. The peel will compost in the soil and nourish your plants. Recycle your cooking water. Did you steam something for dinner? Share the love with your garden! There are a ton of vitamins and minerals that are left over once you’ve boiled pasta, potatoes or any other nutritious veggie. Use eggshells in your garden. Eggshells add calcium to your compost and decompose very quickly. Not only do eggshells stimulate healthy growth, but they also deter snails and slugs that like to chomp away on your hard work. Introduce some new life into your garden this year. It’s always nice to consider planting more perennials than annuals, because perennials will come back year after year, as opposed to annuals that you will only enjoy for one season. Swing by Orr’s to get your hands on a biennial plant, the pansy! 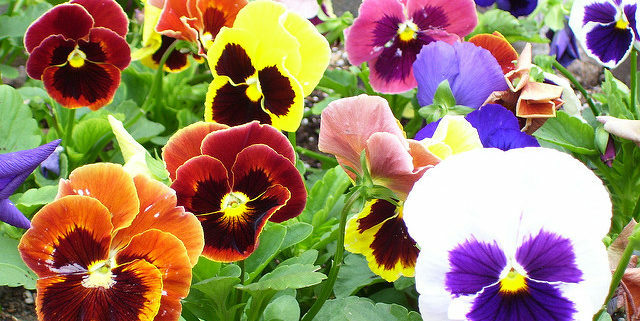 Pansies have a two-year life span, and will surely get your garden up and running for the season. In the event there is an unusually harsh winter, pansies may not come back the next year. Plant pansies in moist, humus-rich, well-drained soil. Pansies like the sun and cooler temperatures. If you’re ready to swing into spring, we invite you to enjoy the beautiful peach blossoms on our farm and make some pansies the first additions to your spring garden! To learn more about Orr’s Farm Market, visit orrfsarmmarket.com. As one of the most obese countries in the world, it’s time that we start downsizing waistlines and moving the meter toward healthy habits. How can we make a difference? It can start with our most treasured legacy: our kids. According to the Centers for Disease Control and Prevention, the percentage of children with obesity in the United States has more than tripled since 1970 to about one in five school-aged children. So if we begin instilling healthy habits early, we can create lifelong conscious eaters. It may be easier said than done, but you should try to guide your family into making healthier choices. Consider making it a common conversation to discuss why certain food choices are more beneficial than others. Then put that stuff in your pantry. Bring the nutritious stuff to your home and leave the rest at the grocery store. This way your kids can have choices of what to eat at home but aren’t necessarily given the option to eat junk. 2. Encourage your children to eat slowly. Slow and steady wins the race at meal time. Promoting this type of eating allows for complete digestion, which allows the body to determine hunger and fullness more accurately. When your body can make this decision, it avoids overeating and embraces impulse control. 3. Have family dinners as often as you can. This one can be tough to navigate. Juggling an entire family’s schedule is a full-time job in itself. If you can’t have dinner together every night, start by choosing two days out of the week, where you are fully in control of what’s at the table. Making time for pleasant conversations, and a good family checkup helps to curb anxiety, as well as the association of stress to eating food, which is a common coping strategy. Here’s where you can truly make healthy eating habits a lifelong commitment. When you start shopping for meals together, you can learn their food preferences and teach them how to prepare their favorite meals. Not only does this kind of involvement help encourage the best food choices, but also gives children a sense of accomplishment. When a child understands the process from start to finish, they are more likely to gain a better understanding of its importance. We’ve seen all of the latest diet tricks and trends, and all of them have an excellent tactic to maintaining a healthy weight: portion control. Pay attention to food labels and prepare meals for your children accordingly. WebMD has a great tip: if kids want seconds, have them wait 15 minutes before adding extra to their plate. The additional wait time allows for proper digestion of their meal, allowing for a more accurate evaluation of hunger. Ready to make the commitment to a healthier generation? Consider bringing the whole family to Orr’s to pick out their favorite fruits, veggies, and snacks. Because everyone is allowed to have a sweet tooth, browse the bakery and have a “treat yourself” moment. Make healthy habits a family affair, and start crossing things off your grocery list at Orr’s today. On this day dedicated to the science of circumference, it’s only appropriate that Orr’s highlights one of our favorite circular goodies: pies. We absolutely love to bake, and we encourage you to come by the market to peruse our selection of flavors. At Orr’s we believe a good pie is always in season. Don’t just think about us on Thanksgiving, swing by the market and pick up a sweet treat to bring to any special event, or even just for Sunday dinner. If you want to make sure that your favorite flavor will be waiting at our store, you can place an order online or by phone. Please call (304) 263-1168 or visit our website and send us a message. We guarantee your pie will be fresh and flavorful anxiously awaiting your arrival. Aside from our fresh baked pies, we have a large selection of other sweet treats. Stop in or visit our website and satisfy your sweet tooth today. https://orrsfarmmarket.com/wp-content/uploads/2016/08/pies-10.jpg 1000 1500 Orr's Farm Market https://orrsfarmmarket.com/wp-content/uploads/2017/03/Orrs_WebHeader_2017-1.png Orr's Farm Market2017-03-14 07:37:082017-03-13 09:44:17Happy Pi Day!! We are thrilled to be back blogging as the 2017 season kicks into high gear! From fresh produce, fun recipes and fabulous events, Orr’s is so glad spring has finally sprung. When you buy in your backyard, produce and other products have a reduced travel time to the shelf. That means fewer steps from start to finish that could lead to contamination. Food that makes a long road trip has the potential for food safety issues at harvesting, washing, shipping and distribution. When you come to Orr’s, you’re getting the cream of the crop, rather than a product that’s traveled thousands of miles with a preservative-packed shelf life. Shopping local is also better for your taste buds. Our veggies are crisp, the fruit is sweet, and all our products have power packed flavor. Food that takes less time and distance to get to the consumer’s hands hold more nutrients. When food is grown locally, the crops are picked at their peak ripeness instead of being harvested early and then shipped to a retail store. At Orr’s you can pick your own produce and take it home with you all on the same day! Encouraging local farming also keeps more green space and open land in your community. Who doesn’t love a beautiful landscape? Plus, local farm markets require less fuel to transport products to the supermarket, which releases fewer toxins into our atmosphere from travel. Because we’re focused on our community’s preferences, we balance demand based on the local need, which reduces overall waste. If we grew it, we’ll tell you a lot about it. Our staff will know the exact labor of love that cultivated our fresh produce. Even if we didn’t grow it, our partnerships with local farmers give us a chance to know quite a bit about what you’re consuming when you leave our parking lot. So we encourage you to ask questions as you shop! Buying or shopping local at any business helps to support the local economy. Many of our products use ingredients found throughout the local community. Purchasing local products not only help us continue to provide you with the freshest produce and other food items, but also make relationships with other community businesses across the region. We want to continue to make connections in our community. When you buy directly from us, you can put a face and even a name to that juicy peach or crisp apple you’re biting into. Become part of the buy local movement and stop by to see us today! Do you have a favorite reason to shop locally? Comment here and let us know!